I had a lot of trouble breaking such a powerful speech down into a short video, even though it can also be broken down into a single sentence. Essentially my take on the program is that there is no beginning and no end to anything. We are all an integral part of the universe and in order to be successful in this life all we have to do is whatever we have been doing already. 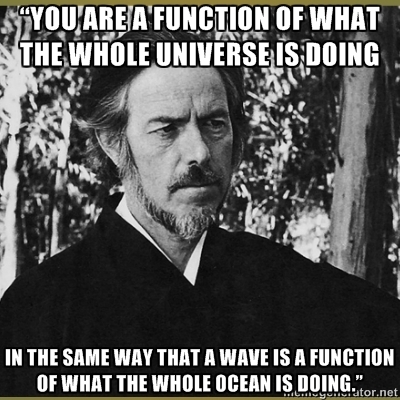 LOVE Alan Watts. Sure many others here do as well. Embed your links & make them accessible but not the focus of your thread. To be is to do. Sartre. To do is to be. Descartes. To be do be do. Sinatra. TSBU wrote: To be is to do. Sartre. Q. What's the difference between Dubai and Abu Dhabi? A. The people in Dubai don't like The Flintstones but the people in Abu Dhabi do. I don't usually tell jokes but your post reminded me of it. between the lines wrote: Essentially my take on the program is that there is no beginning and no end to anything. We are all an integral part of the universe and in order to be successful in this life all we have to do is whatever we have been doing already. I haven't watched the program, but this perspective makes sense to me. There is essentially nothing we can "get wrong" because all is connected, therefore there are no external rules and there is nothing separate that "matters" -- there is only the experienced fullness of each moment. To think otherwise is to give one "something to do"... to feel right and productive and important and necessary and good and valid. However, I suspect that if we evolve beyond that particular human construct of limited "reality", we will discover that there's an even more fulfilling experience in being freed of such ideas, because then we can be more fully present and engaged in each moment of possibility on a vast playing field. We tie our own selves up with the constructs we think. There's much to like about the video - well done! Much work and creativity in evidence. 2) "the universe" is defined as what human senses and sensibilities perceive it to be. So, if a rogue planet annihilated the Earth next week, there would be gravitational imbalances in the solar system, but the universe would persist. Then again, the broken molecules floating in space in the aftermath of such a disaster could also be termed as "us" - still playing a role in the solar system environment. Greta wrote: There's much to like about the video - well done! Much work and creativity in evidence. The thing I've come to realise about philosophy, Greta, is that we can talk the Universe into being whatever we like. Harbal wrote: The thing I've come to realise about philosophy, Greta, is that we can talk the Universe into being whatever we like. True. We can talk just about anything into or out of existence. One has to be unusual stupid in order to take this vid seriously! What he says is pure nonsense and babble, and the really big bomb comes when he says we can't exist with out the universe, and the universe can't exist without us. All we need is the sun, and the universe doesn't need us ..FFS!!!! you can take that statement so many ways its ridiculous.